Southern Sun – Bring your favourite movies to a theatre near you. 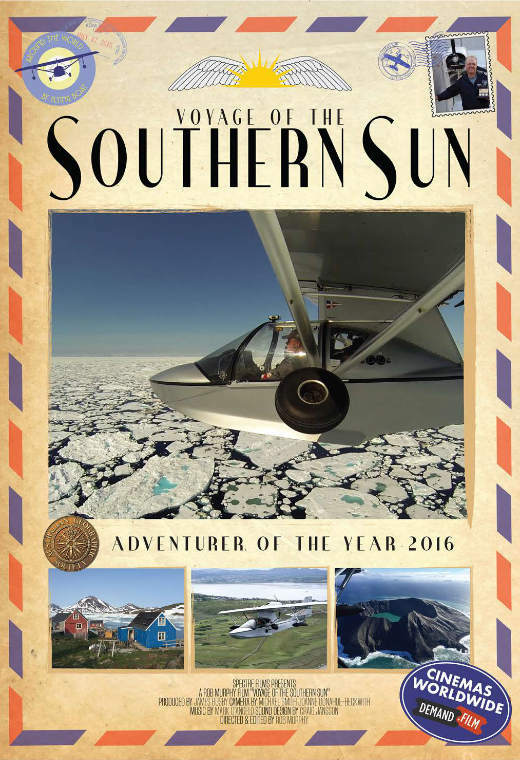 Adventurer of the Year, Michael Smith discovered the delights and perils of true adventure in a solo circumnavigation in his tiny amphibious flying boat, Southern Sun, that retraced historical Qantas, Imperial and Pan Am airmail routes, in search of the glory days of 1930’s aviation. At a leisurely 80 knots, taking his time flying from cities to forests; deserts and rivers; over mountains and volcanoes; coral reefs, vast stretches of oceans, ice flows and glaciers; oh, and giant rats. Michael’s journey captured the geographic splendour of the world and learnt a little of human kind and himself along the way. Directed by Bert Murphy, featuring stunning footage, tales from around the world and insight into the high’s and low’s from a record breaking and award winning voyage.